Responding to the release of a new study earlier this month that shows adult Americans rank below average in math, technology, and literacy skills as compared to 24 other developed countries, U.S. Education Secretary Arne Duncan told NBC's Matt Lauer that the findings "confirm what so many of us already believe, that we have a real state of crisis." In Florida, a group of parents are proceeding with a lawsuit against the state for neglecting its responsibility to offer an "efficient, safe, secure and uniform high-quality" education to their children. In a recent article in The Atlantic exploring why a whopping 40-50 percent of all teachers choose to quit the profession within their first five years in the classroom, the reasons cited range from a lack of respect and professional support, to being underpaid, overworked, and generally burnt out. The symptoms of a crippled American education system are evident throughout our daily news cycles. Yet despite the increasing number of obstacles and frustrations with which public school teachers must contend, there continue to be thousands of educators across the country who remain deeply invested in their work and their students, and are finding creative ways not just to subsist within a flawed system, but to flourish. So why is it that some teachers are succeeding so exquisitely while others struggle? This is the driving question behind my new book American Teacher: Heroes in the Classroom, which shines a spotlight on fifty truly outstanding teachers and invites readers into their classrooms to witness their methods, achievements, and impact firsthand. From their example, there is so much to be learned, not just about what it takes to triumph as a teacher, but about the strengths and weaknesses of our national educational system, and about what can be done to make it better. 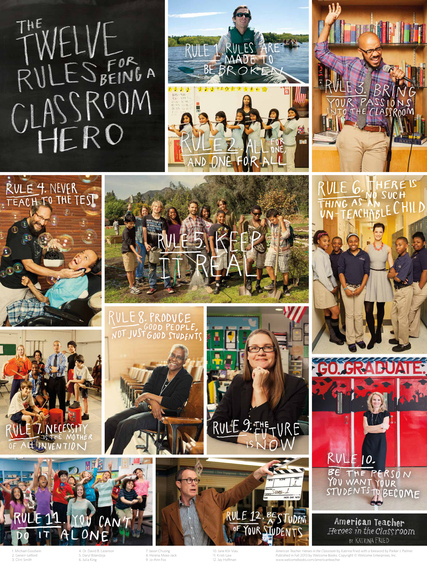 The brilliant educators featured in American Teacher represent a wide assortment of backgrounds, academic subjects, experience levels, scholastic environments, and student demographics. Yet regardless of their many outward differences, there are certain shared ideas and principles about teaching that can be gleaned from all their profiles. I've gathered this group of precepts into the Twelve Rules for Being a True Classroom Hero. Of course there are no absolutes when it comes to defining the formula for great teaching (see Rule #1 as case in point! ), but what follows is an excellent starting place.